I have a few elements in my display that require 8 channels of control at low current. Instead of using the higher current channels in my main controller enclosures, I designed some small boards to put right there at the element. They have P-DMX (power + DMX over CAT5) input and 9 low current outputs (2A max total). Up to 8 of these boards can be wired back to one of my APC707 P-DMX distributors. 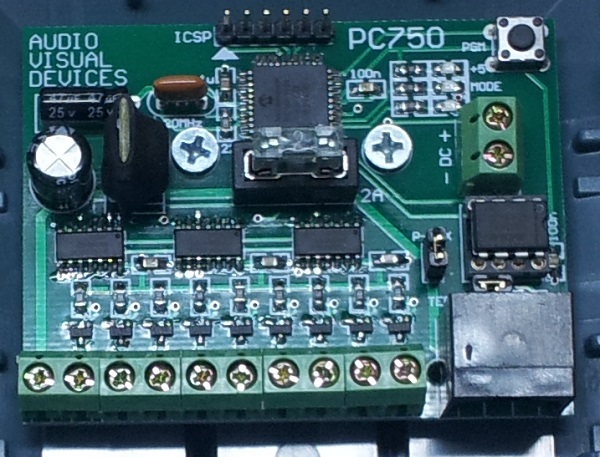 The board has an RJ45 for the P-DMX input and a terminal block for the DC outputs. It also has a separate DC terminal block so I can use it with a plain DMX input. The start address is programmed the same as my DC24 and DC48 boards. 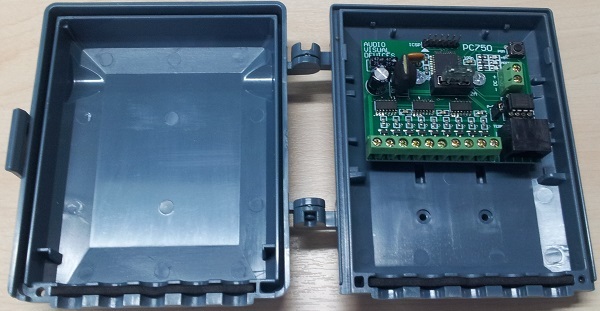 3 LEDs indicate that the board has power, is operating normally and is receiving DMX. The usable power supply voltage is 9V to 30V so suited the 12V and 30V lights I had. I designed the board to fit into a Kingray masthead amplifier enclosure. This makes it weatherproof and easy to mount on the display element. The enclosure has enough access slots at the bottom for the CAT5 and output cables.